Imagine being an engraver, where attention to detail and keen eyesight made many a practioneer of that trade dispensable by the time they were in their mid-30's. The American Banknote Company, one of the leaders in 19th century engraving of checks, currency, postage stamps, etc. certainly would have found this little vise, patented in 1882, a suitable tool to produce some of their work. 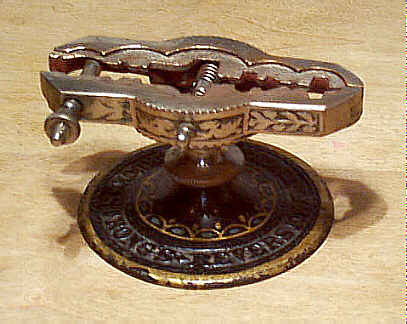 This vise, proudly embossed "Strongs Reversible Engravers Chuck" about the base, captures the essence of the tool as art. The cast iron base measures but 3 1/4" in diameter, and is japanned black with handpainted detail of gold and blue. Atop the base is a nickel plated collar that allows the vise's 4" long jaws to rotate 360 degrees. Above the collar are the nickel plated, and elaborately cast, jaws that are reminiscent of the famed Miller's Patent Ploughing planes. The jaws are hinged at one end, with the opposite end carrying a screw to set the width of the jaws. At the middle of the jaws are two springs that force the jaws apart as the screw is adjusted. There are five circles of varying diameter cast into the top of the jaws so that the vise can hold different sizes of work. Not being one who fancies engraver's tools, this tool goes above and beyond being just a tool. It's a work of art in anyone's eyes, and thus can rightfully be elevated to Inner Sanctum-hood.